Eastern Woodlands Native American Indians have used trade silver brooches to decorate their pow-wow and ceremonial regalia for years and years. Our heart brooch is made in the tradition of brooches made for generations. This distinctive style is representative of the tribes of the Eastern Woodlands. 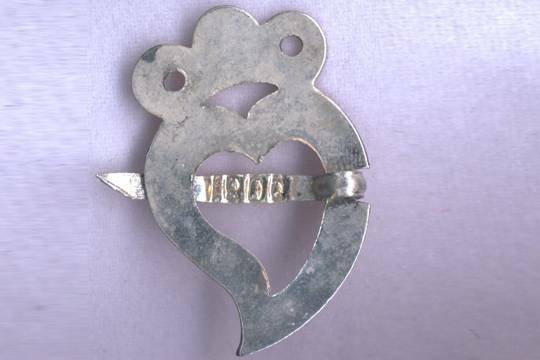 And, although meant for traditional accompaniment to native shirts, bags and other gear, we think this sweet heart pin appropriate for any special blouse or even for your artwork. The traditional look is very special and will lend itself to your shrines and memory keepers. The pin swings from the back and, as with classic brooches, there is no additional clasp. 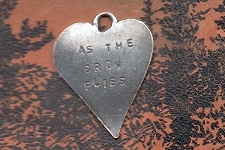 The heart measures about 1 inch high and about 3/4 inch wide. These are handmade as they always were. Each is silver-plated tin so there may be some tarnish patina to any one of them. We like them better that way. But, of course, you can polish your heart, if you choose.